The SRC Mobile Fall Restraint system is a versatile, non-penetrating, counter-weight system that keeps personnel travel within prescribed safe area limits. System is mobile and can be quickly installed by a single person. 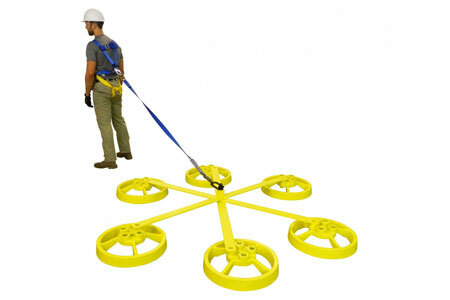 Usable in all flat rooftop applications that require OSHA compliant fall protection. Approved surfaces include EPDM, TPO, BUR and single-ply membranes. Installs quickly and easily without damaging roof membranes.